Convenience is a trap word. Many retail surveys ask the question: why did you choose the store you shopped at? (Normally this is accompanied with a similar question: why didn’t you choose our store?) One of the answers provided is convenience – and many people choose it. However, what does the response really tell us? Pretty much nothing, because convenience can be interpreted very differently by the respondent. In choosing your store did you drive by a competitive store? Is there a closer store to you than the one you chose? These questions begin to dimension convenience. A marketer needs to dive deeper into the psyche of the shopper to really understand the “convenient” motivation. An old school perspective (preinternet) was much easier because it was brick & mortar versus brick & mortar. Today, it convenience begins with your smart phone and radiates out from there. A smartphone allows the shopper to buy anywhere any time – the ultimate in convenience. The majority of marketing traffic is coming from mobile devices today. This is a fact not an insight. 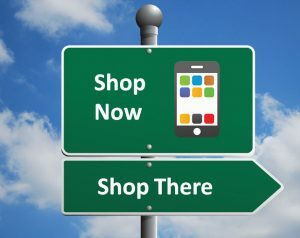 The true insight behind mobile shopping is where did they shop: Was it at home? Between meetings at the office? Walking down the street? In a competitive retail location? Answering these questions provides insight into the shopper’s mindset and purchase scenario. Shopping online from the couch is nothing new (just ask QVC, HSN or any infomercial – they turned home retail into an art). Shopping from home is highly convenient for many retail categories. So, why don’t more people shop from home? Why even venture out of home when buying necessities like groceries, clothing, household products? There is a behavioral shift occurring in many product categories. The question is what will be the equilibrium point between home versus brick & mortar shopping (and what brands will survive). The Right Turn is shopping at a retail location on the way to a specific destination- this is primarily someone’s commute to work. And yes, people favor the right turn. Again, convenience is not the “closest”. It is the retail location which is easiest to access and continue on their commute. This major factor with many gas stations, quick serve restaurants, and coffee shops. The corner store is the nearest store location to home. Depending on the retail density this may be a moot issue. Think of retail density as instances where a there are two or more competitors within a quarter mile of each other. In this situation, convenience is a non-factor and the store choice is based on another motivation. In some instances you can have competitors across the road from each other. For example, ALDI often will choose a location across from a Walmart or Kroger. When a shopper drives by competitors to go to a location, the retail location is a destination – the primary objective of the trip. Obviously, this is the least convenient, but probably the most telling in a shopper’s motivations. For example, roughly ten percent of drivers are destination fuelers. They will find the best price (usually through an app like Gas Buddy) and then go to the location. Price is driving the decision (pun intended). The convenience circle can be summarized as Fluid Shopping. 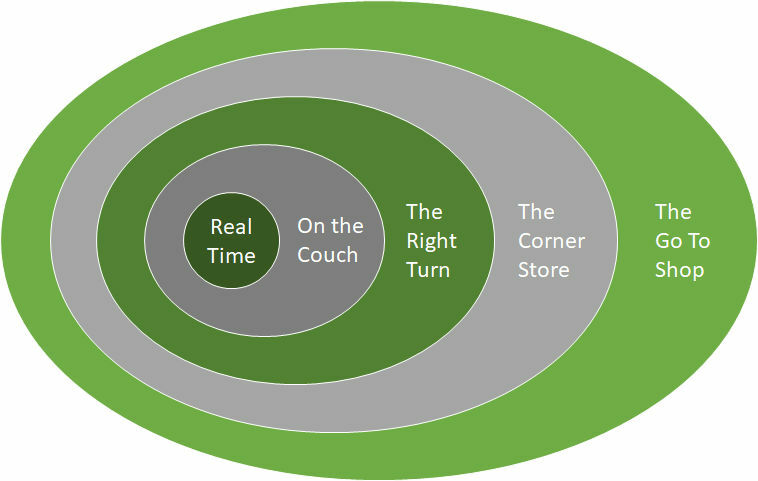 Shoppers aren’t consciously choosing On the Couch, The Right Turn, or The Go To Shop. Rather they are gravitating to what feels right in the scenario. Other times the shopper’s choice is based on habit. The shopper isn’t thinking at all – they are acting naturally. In conclusion, it is important for a retailer to apply this both to how shoppers access their store and how they market to these shoppers. Many marketers think from the store out, as oppose to the mindset and scenario in relation to shopping. The mindset uncovers the shopper’s motivations (e.g., Is this really about convenience or are their other factors influencing the purchase?). The scenario provides context on why the shopper purchased at this time and in this location. In Fluid Shopping you want to be omni-channel, and you also want your marketing to be omni-present. Let the shopper choose their channel of choice, and just as importantly market to their motivations to close the deal. Are you an inside out marketer? Plenti’s Decline: Is loyalty tied to love of Brand?